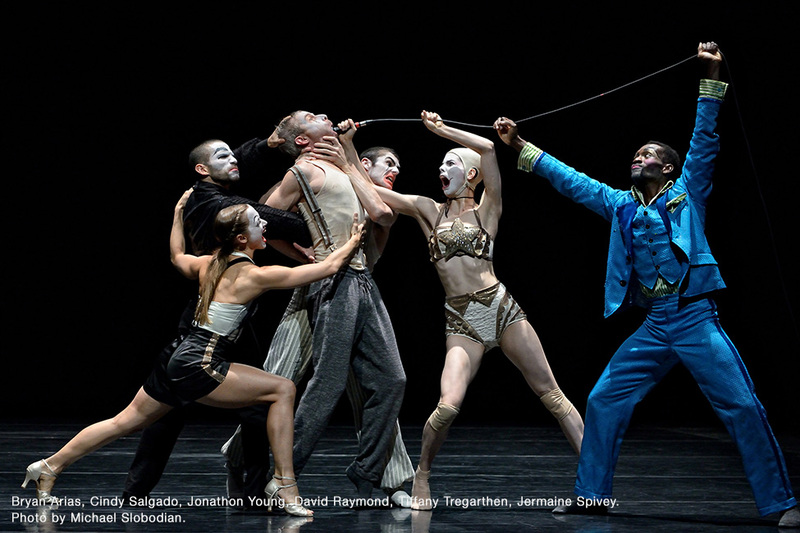 On Sunday 9th April, Betroffenheit by Crystal Pite and Jonathon Young won the 2017 Olivier Award for Best New Dance Production, and with good reason. An abandoned, industrial room with thick, rope-like cables weaving up the walls and across the floor. Voices reliving past horrors, urging to ‘come to terms’, persuading to consume substances to forget. Darkness, flashing torches, running shadows – never before have I felt genuine fear sat in a theatre. Young is trapped and consumed by grief, in permanent statis upon discovering the unimaginable. We are taken into the depths of his mind with nowhere to hide. He is a skilled performer, use of voice (both live and pre-recorded) reveals a never-ending internal monologue and a battle with addiction. Yet the performance doesn’t rely on the the text to tell the story, neither is the movement a literal display of emotion. 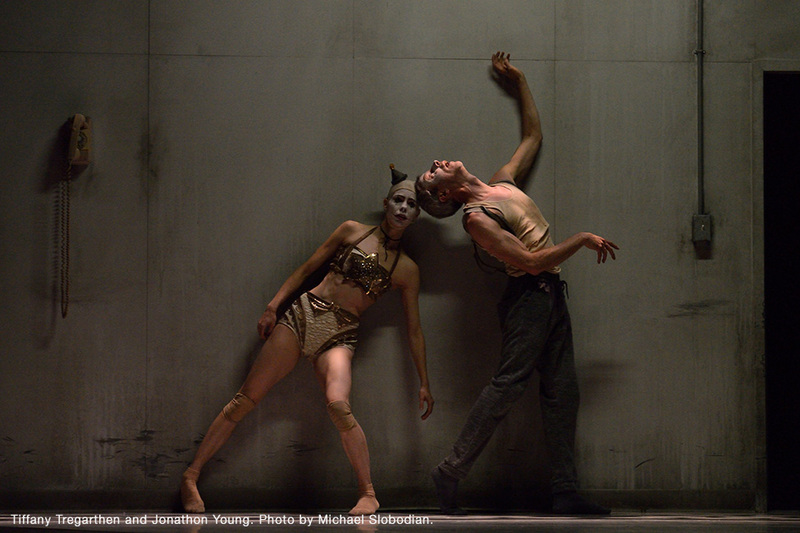 Betroffenheit is dance theatre the way it should be. Jermaine Spivey as Young’s alter-ego uses a unique movement language (isolations, waves, popping) – to find the rhythm in the text. Later, Young’s addiction bursts onto stage as an intense ‘showtime’ -with huge pink feather fans, we see salsa, jazz, tap and Charleston. At the end of the first half, we’d seen and experienced an assault of emotions, and needed the interval to regroup. As the curtain rises, the room has gone and a single column, off-centred, takes its place. The characters from the first half are abstracted through movement. The painted faces and colourful costumes replaced with loose clothes in shades of grey. Cindy Salgado and Tiffany Tregarthen have a stunning duet, largely of gestures as if searching for something they have lost, entirely in unison – timing and isolations so together it’s as if one is a hologram of the other. Contact improvisation is the drive behind this half of the piece, the company move fluidly together, transitioning seamlessly from one impossible lift to the next. In the end, all can leave the stage but Spivey – half dancing, half collapsing under Young’s grief until the final moments. Betroffenheit is genius. I am certain that I was not the only one to have tears roll down my face as the curtain closed – something that has never happened to me before. The piece was altogether cinematic. 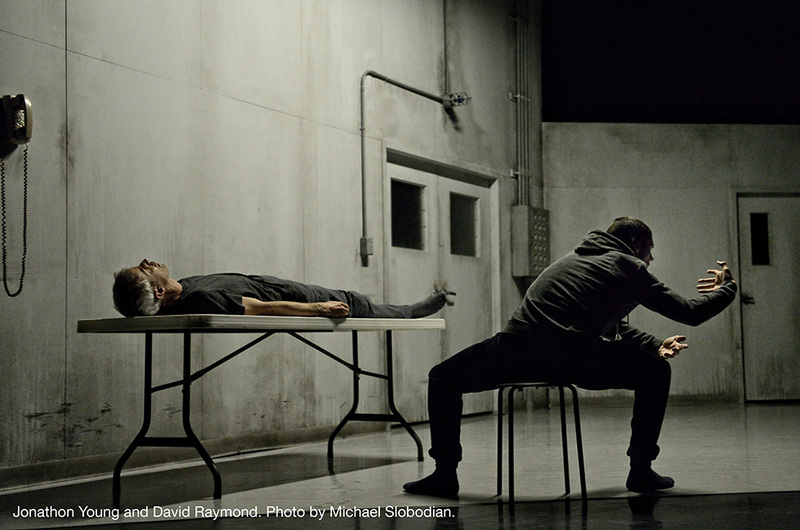 Young and Pite are the perfect artists to tell the incommunicable on stage, answering their own question: “what can dance do that words can’t, and what can words bring to dance?”. Only after seeing the performance did I discover that the root of the work stems from 2009, when Jonathon Young’s teenage daughter, Azra, was killed along with her two cousins, his niece and nephew, in a holiday cabin fire. Young was asleep in an adjacent cabin, and by the time he arrived it was too late. Read more on this here.